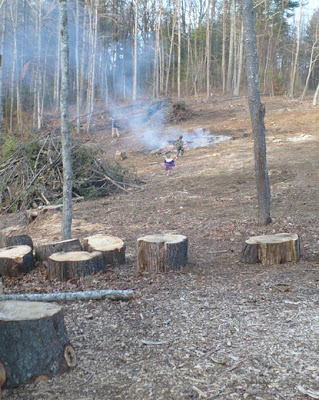 Now that the snow is gone, and the ground is thawed we are able to start making some progress on our land again. 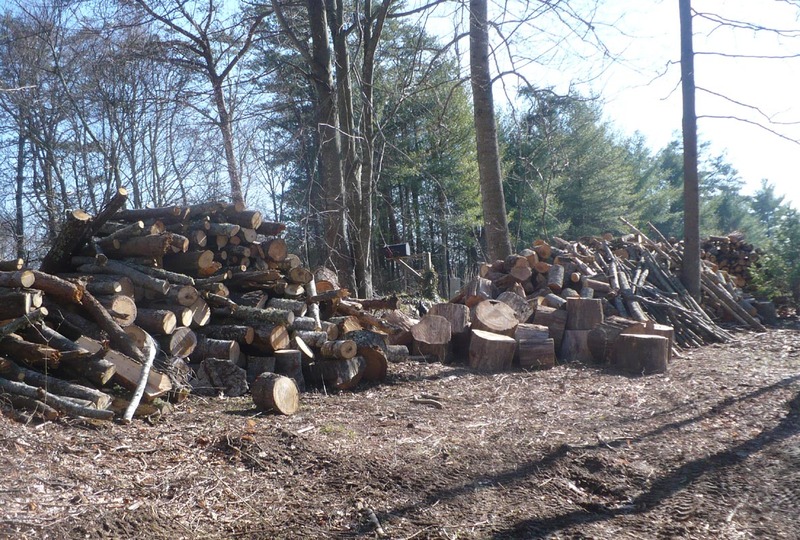 Kenan has been busy clearing and cutting up all of the scrap wood from the area we had cleared this past fall. He still has a lot of work to do here, but it is finally beginning to look opened up and i'm really starting to see it's potential. 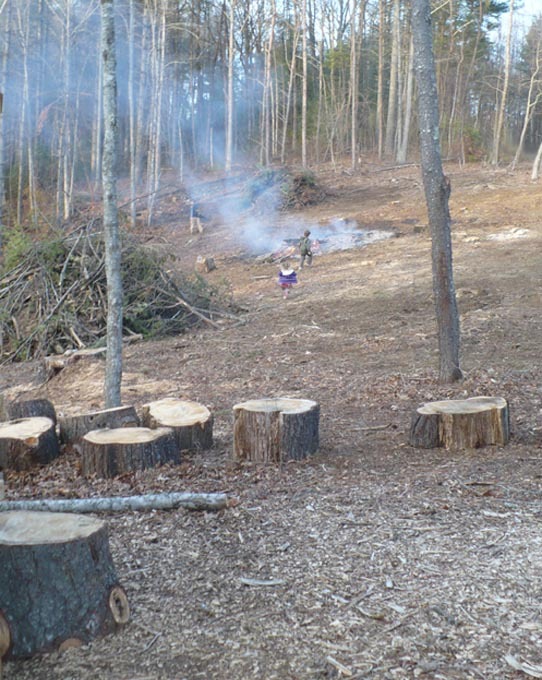 Over the winter, i looked out the window and saw a depressing area of downed trees, and scrubby mess. Now when i look out i am beginning to see some open space. i can envision goats grazing in a pasture. i can see a large area perfect for another garden. i can see where we could plant a small orchard. i can see so much potential for this area, and it's finally begining to feel like we made the right decision in cutting the trees. There were many small trees that were felled, but not big enough to sell. Kenan has been cutting and hauling these, and we will be totally set on firewood to heat our home next winter and possible even the year after. This is just the start of it, he still has a ton of wood to cut, move and stack. 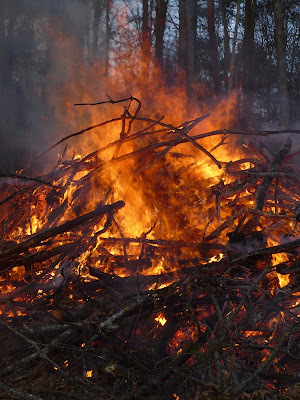 This past week we have had gorgeous spring like weather, and have begun to burn a lot of the pine scrub and wood that isn't good for burning in the woodstove. We have all have spring fever, and have been enjoying late night bonfires and veggie dogs roasts. 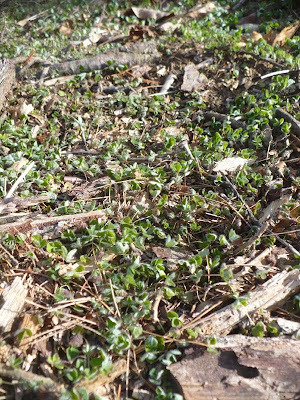 We've began planting clover for the goat pasture. 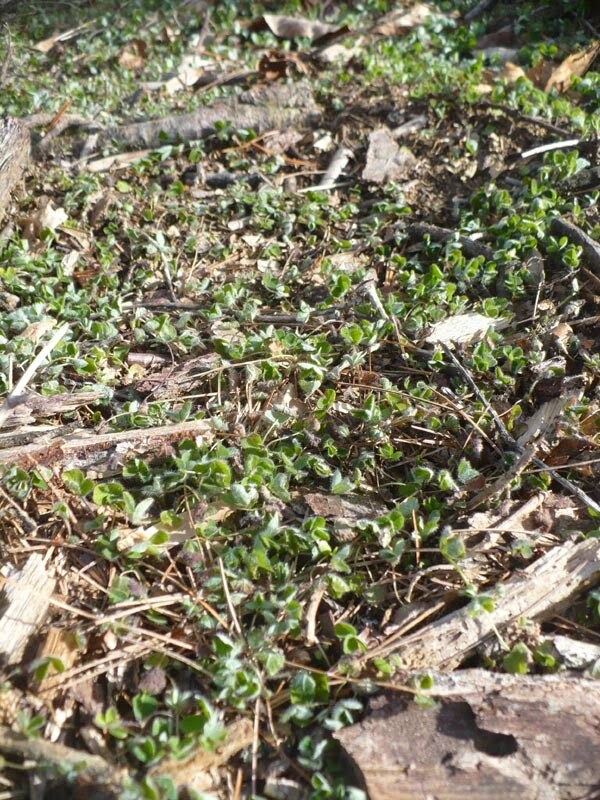 Little bits of green beginning to sprout, a sure sign that spring in near. 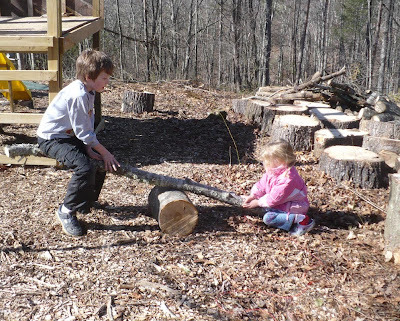 Ever since i first visited Loblolly Park at the Museum of Life and Science in NC about 4 1/2 years ago, i have dreamed of creating an natural/musical play place for my kids. It is one of the coolest parks i have ever been too. 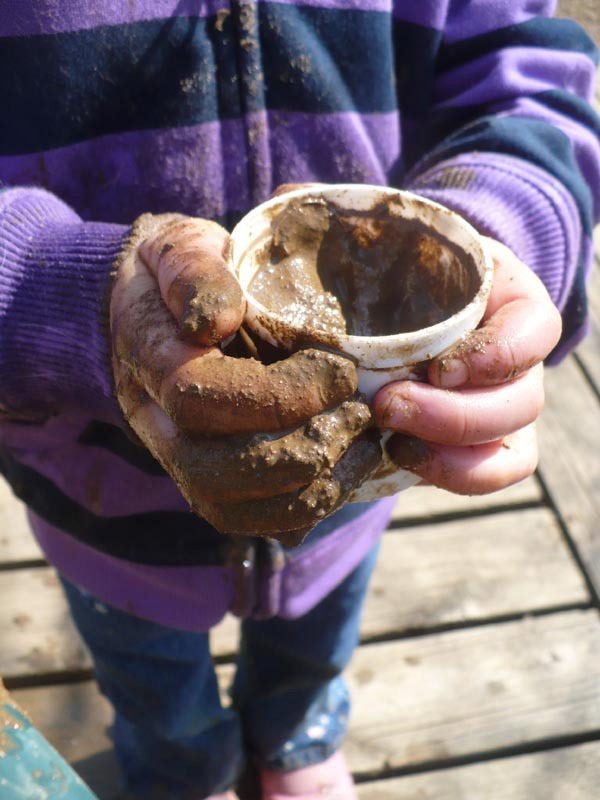 They have a large wooden play structure, a giant sandbox, water play and musical/banging walls made with recycled materials. Old pots and pans, hub caps, old windchimes...anything that is good to bang on and can make noise. This past fall Kenan began work on a play fort for the kids. It doesn't look like much yet, but as soon as he started it, my head exploded with ideas. The bottom section will be turned into a sandbox, and partially closed in. One of the wall will be a chalkboard wall, and one will have a door and a service window for pretending it's a restaurant or market or whatever. There will be a banging wall, two levels of re-purposed hanging things the kids can bang on to make music. The south facing wall will be made of trellis, and we'll build a garden box in front of it. Where the kids can plant sunflowers, peas, beans and climbing plants that will grow up the side of the structure. 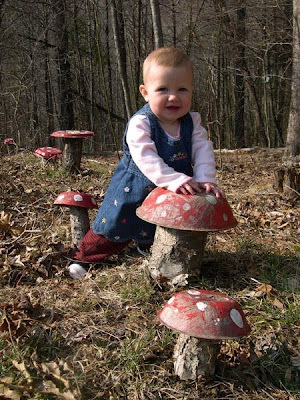 i really wanted to create a natural playscape, even though we are surround by woods which truly is nature's playground. 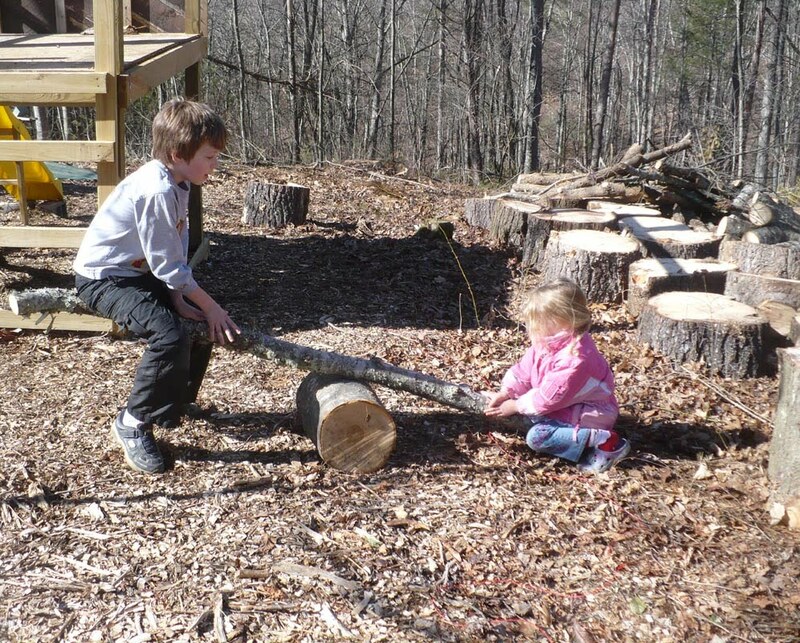 When Kenan cut these huge slabs from a fallen pine tree i immediately claimed them for our play area. i want to create an enclosed 'safe' space, and will use these to border one side of the area. 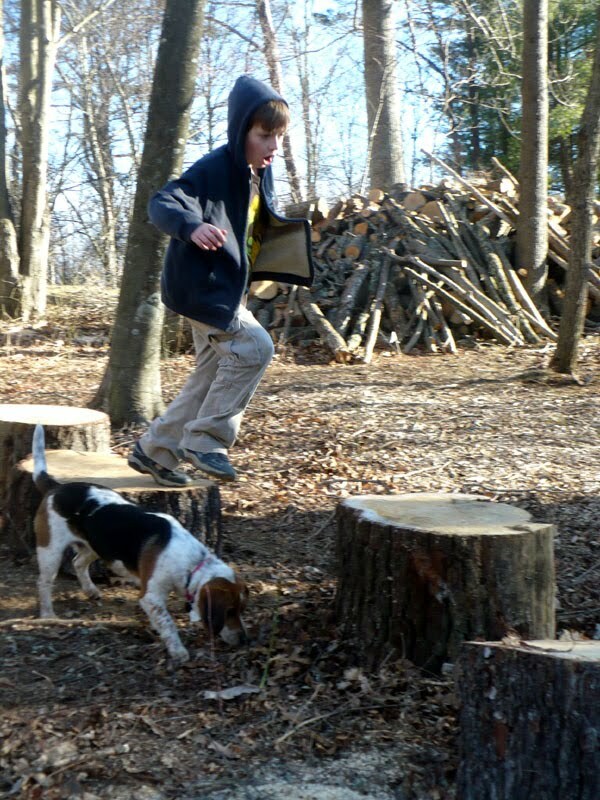 They are perfect for jumping across, balancing on, using as seats and tables. This is the natural play fort we made last year. Now that the area around it is opened up a bit, we can create a path connecting it to our play area. 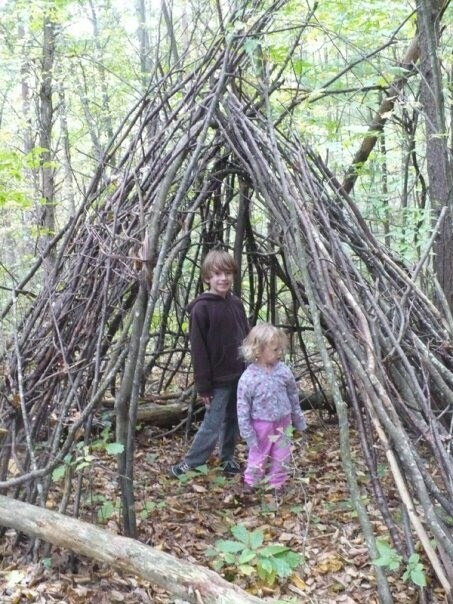 This picture is from last year, but it is still standing and and is even more filled in with sticks and branches now. It also has much more sun exposure, so we can attempt to grow some climbing flowers around it. 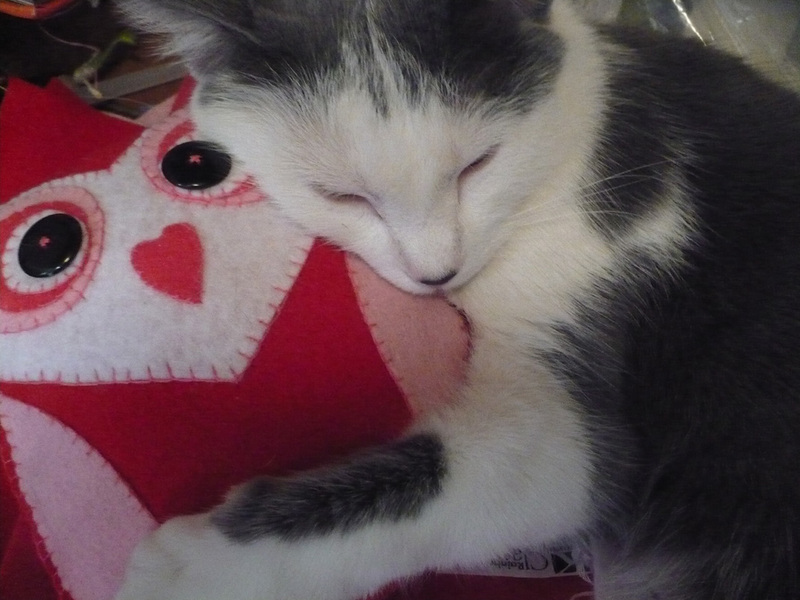 This is obviously an old picture, i think Sage was just a year old here. It was the best picture i could find of them though. i created these toadstool about 5 years ago, when Sequoia was only 3 or 4 i think. They are made from metal and wooden bowls i found at the thrift store. 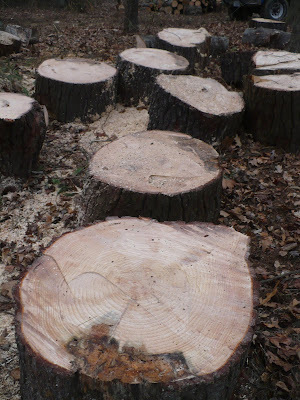 i need to re-paint them and replace the logs on some of them and then i'll create a fairy circle with them around the play area. So right now it doesn't look like much...infact, if you were drive past my house, it just looks like a rather big mess...but it is a slow progression, and i can see the potential in all of it. It is going to be amazing one day, it really is. This has turned into a rather long post. :) i'm just finally beginning to feel a bit excited about it all, rather than the frustration i felt most of the winter. So i wanted to share in my ideas and dreams about this bit of space. i will post updates as things begin to move forward again. ***Quick reminder The Old Gates Farm giveaway is ending on the 29th! Make sure and get your entries in and show your support for this wonderful WAHM! Congratulations!!! i'll send emails later today. You will have 48 hours to claim your prize or a new winner will be chosen! Thank you all who entered!!! 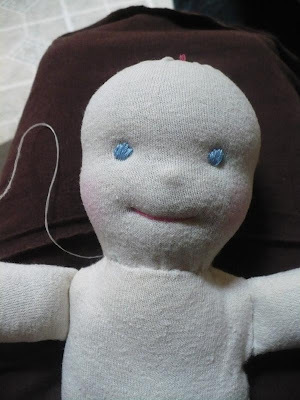 Just had to share my doll progress. i am so in love with making these! i truly cannot wait until i can order real doll making materials, but until then i have been enjoying making them out of scrap materials i have around the house. i took a special trip to town to find some lovely wool yarns to use as hair, and was completely disappointed. 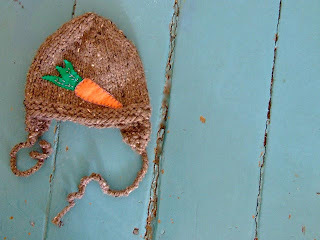 i found a basic brown yarn, but nothing else that would work. So, i decided to play around with some of scrap yarn ( i have a bin just full of little balls of misc colors) and make a doll wig. This isn't sewn on, it's to get some ideas about how i would like to do the hair on these. The yarns are mostly acrylic, but i love the way they look!! It gave me amuch better idea about what types of yarn i am looking for. i was happy about the way the doll looked without hair, but once i put the wig on her...i knew she was going to beautiful!! 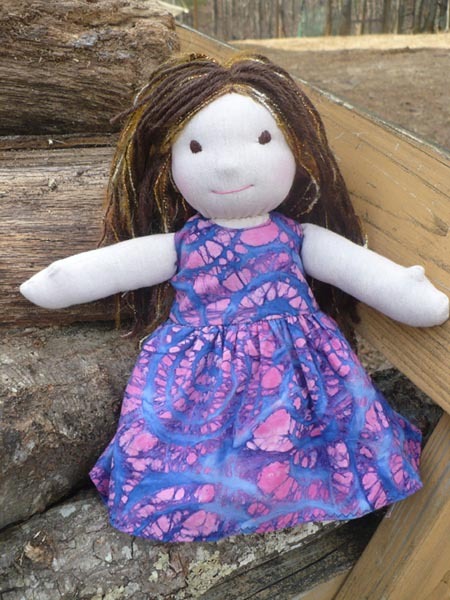 Here is a picture of the full doll. She is 12" tall. i still have a few tweet to work out with the pattern and learning to sew a little straighter. :) Tomorrow i'm going to work on making her some clothing. This was the third 'practice' doll i made, the first one from the hemp fabric. The one i posted above was the last doll i made. You can see in this one that my legs were a bit small and not quite right. 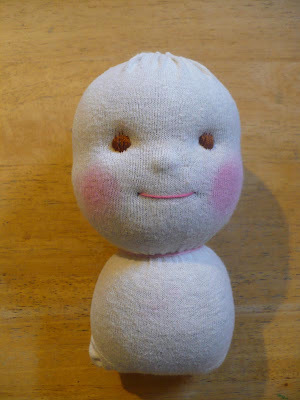 i think i figured it out though, and it looks much better in the other doll. i also had some problems with her neck. If you look in the last doll post, you'll notice she had a weak chin and a thick neck. i played around today and added some stitches, and really improved the look of her chin and neck. After that, i knew i had to make her a wig as well. Again these acrylics, and i'm a bit torn whether to keep them and sew them on permanently or wait until i have some pretty wool. She was so pretty with her pink hair, that i had to make her a matching outfit. Seeing these finally coming together makes me really optimistic about investing in the materials. 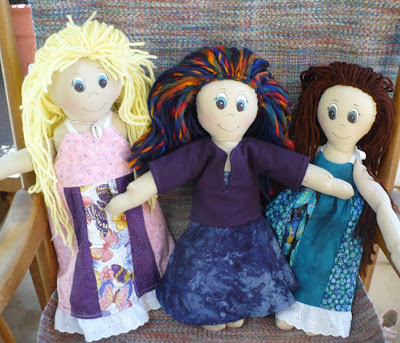 i have been wanting to make Waldorf style dolls for many years, but have been to intimated to seriously try. i really feel like this is something i can do. i feel very passionate about it, and love the time spent molding the head and hand stitching the pieces. 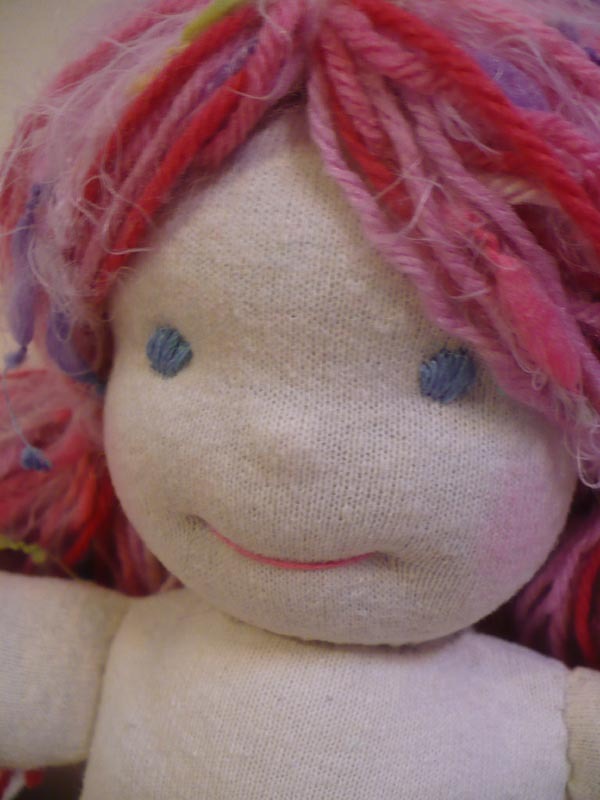 You truly begin to feel very connected to each doll. So, i am really hoping to get my materials ordered this week, and then i will be diving into this new venture. i would love to eventually find a local source for the wool stuffing, and i've been talking to my mother-in-law and sister-in-law about possible spinning the wool for the hair and knitting tiny sweaters. i feel like it has been a long time coming. You'll be seeing more dolls in the coming weeks, i hope you enjoy seeing their progress. Well, almost wordless. 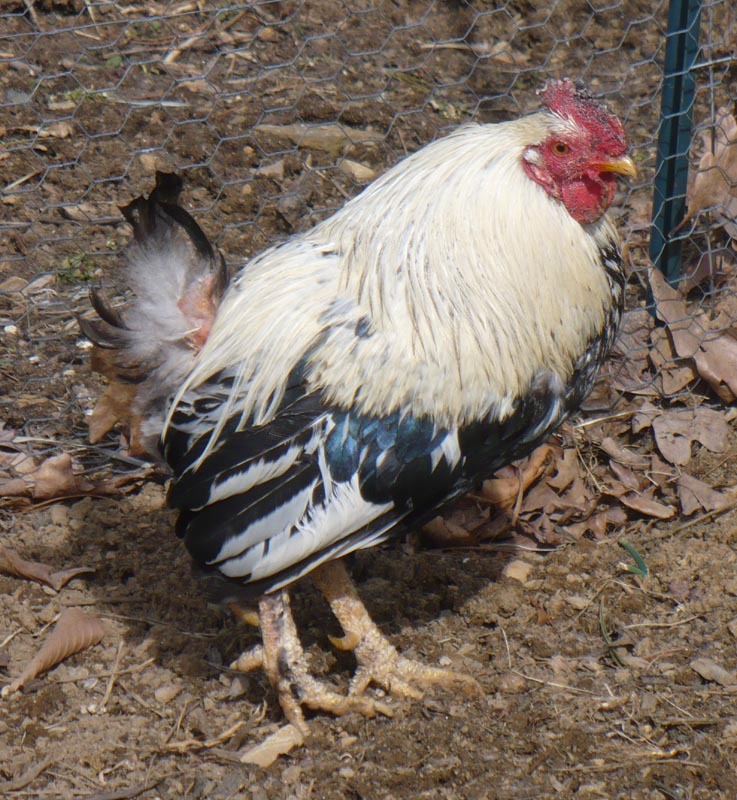 About 2 weeks ago this rooster disappeared leaving a trail of feathers across the yard. 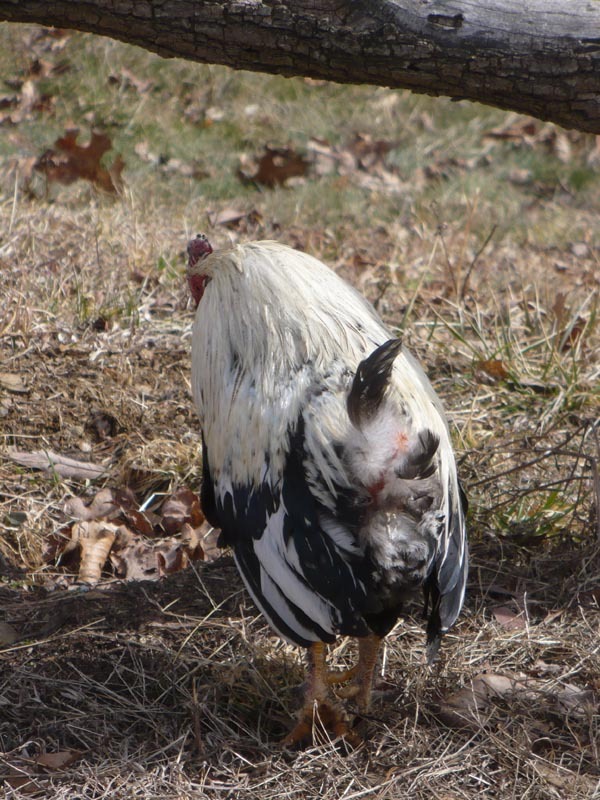 We assumed the worst, having already lost several birds to a hungry predator earlier that week. 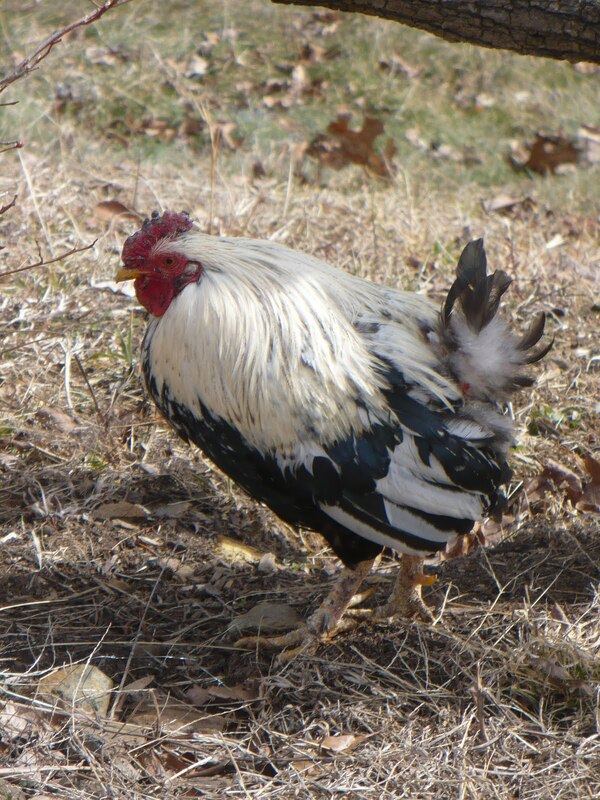 Then to our complete surprise almost a week later our neighbors, a 1/2 mile away, brought him home minus his tail. They'd noticed him hanging out down at the bridge and thought he might belong to us. If only he could talk, i can just imagine the tales he would have to tell. 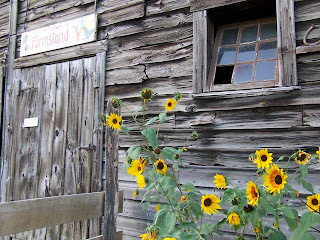 You can see more Wordless Wednesday posts here. 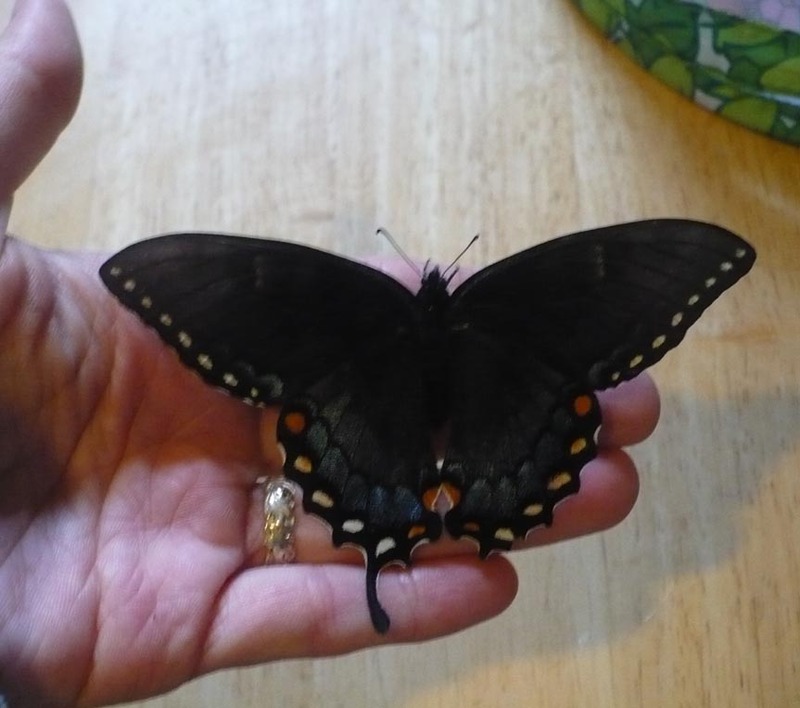 At the end of last summer, early fall, we found a Tiger Swallowtail caterpillar. We brought it inside to raise with our monarch caterpillars feeding it Yellow Poplar leaves, which is one of it's host foods. 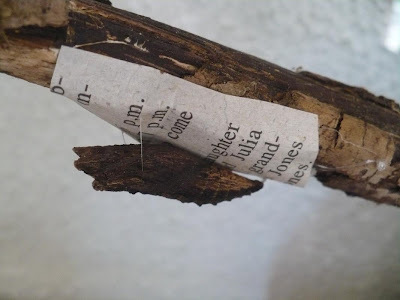 Our caterpillar formed it chrysalis that very night, and i expected that in 2 or 3 weeks we would be watching our caterpillar emerge and fly away. 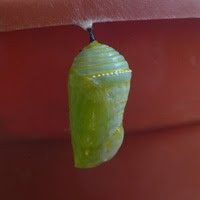 What i didn't anticipate was that it would overwinter in it's chrysalis. All winter we have had this stick propped up inside a vase sitting on top of our bookshelf. i hadn't totally forgotten about it, but really wasn't expecting it to emerge for quite a while so i haven't been checking on it regularly. 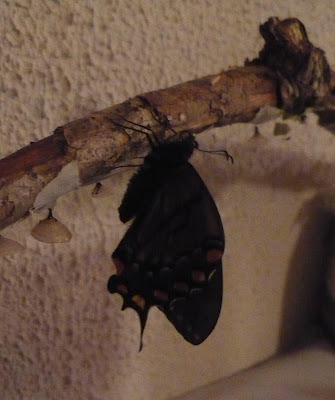 So you can imagine my surprise when i went to feed our frogs and saw a newly emerged butterfly hanging upside down drying off her wings. 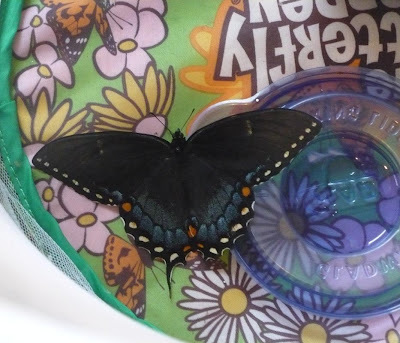 i transferred her to our butterfly garden to protect her from my cats who had spotted her and were waiting for their chance to pounce. This is a female. Eastern Tiger Swallowtails come in two forms, light and dark or yellow and black. 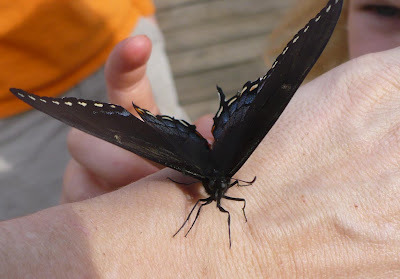 The Yellow Tiger swallowtails can be either male or female, however the dark (black) form is always female. We gave her a bit of sugar water to eat, and then pondered what to do with her. 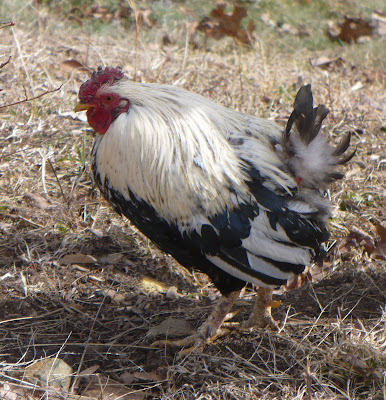 i suppose she emerged early because the woodstove keeps our house so warm. We have also had a couple of really nice days in the high 60's low 70's. The impostor lady bugs and wasps have begun to appear inside, so it really should not have been a surprise that our butterfly would chose to emerge as well. We really were not sure what to do with her. We could keep her in captivity, and feed her sugar water and rotting fruit. 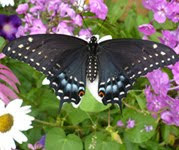 Swallowtails only have a lifespan of about 2 weeks. Although our temps have been nice, it is supposed to get cold again. Butterflies are cold blooded and need day time temperatures of 55-60 degrees to fly. All morning our butterfly sat at the top of the enclosure, frantically beating her wings trying to escape. i decided that a life in captivity is not a life at all for a butterfly, so we decided to release her knowing that if the temperatures drop too low she will die. We chose to trust in nature. Butterflies have very strong instincts. She wants to fly to find a mate and lay her eggs. Who are we to stop her? So yesterday our temps were over 70 degrees, and we took her outside. i just barely had a second to snap this picture before she flew. She flew straight up as fast and as far as she could, as if she knew exactly where she was going. i think she did. 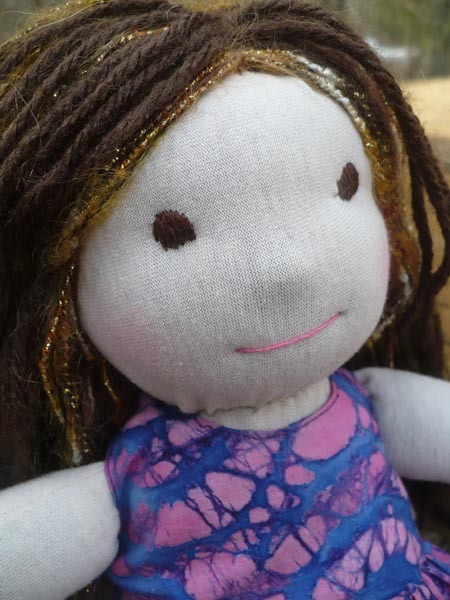 If you have been following my blog for a while, or are familiar with my website at all then it will be no surprise to you that i LOVE making dolls. Then, a few years back i began making a few crocheted dolls. The mermaids are my favorite of these. 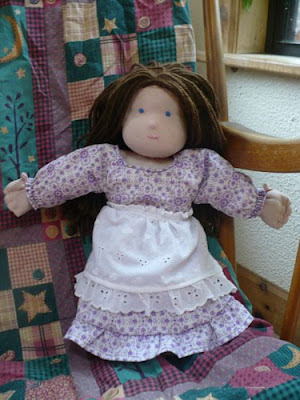 When my daughter was 2, i really wanted to make her a Waldorf style doll. This was my first attempt. i didn't really know what i was doing but she still came out okay. 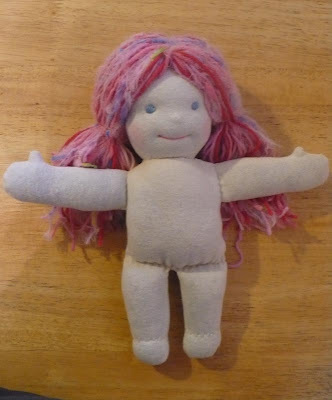 i fashioned her body after a Cabbage patch kid. So she has stitched fingers and toes. i made a second one for a friend, and this one came out slightly better. i had a really tough time with her hair, although i had followed a tutorial online for making he crocheted cap and then adding the hair individually. It was incredibly time consuming and i did not love the results. i didn't attempt another for several years. The last couple years, i have really been wanting to get back into doll making but have been too intimidated to start. The materials just to start are very expensive and i wasn't totally sure where to get them from. This year, i decided to put aside the fears, invest in the materials and just do it. i decided it would be best to make a few 'practice' dolls before i orders the materials and just start cutting away. So i found an unbleached cotton t-shirt at the thrift store that i thought would work perfectly. So this was my first attempt, and i already see a bunch of things i did wrong. The face is very lumpy, the neck is very wrinkled, the eyes are not even ...the arms are a bit too long. The outfit she is wearing was made by my sister in law, and the outfit is so cute it hides all the doll's wonkiness. lol. 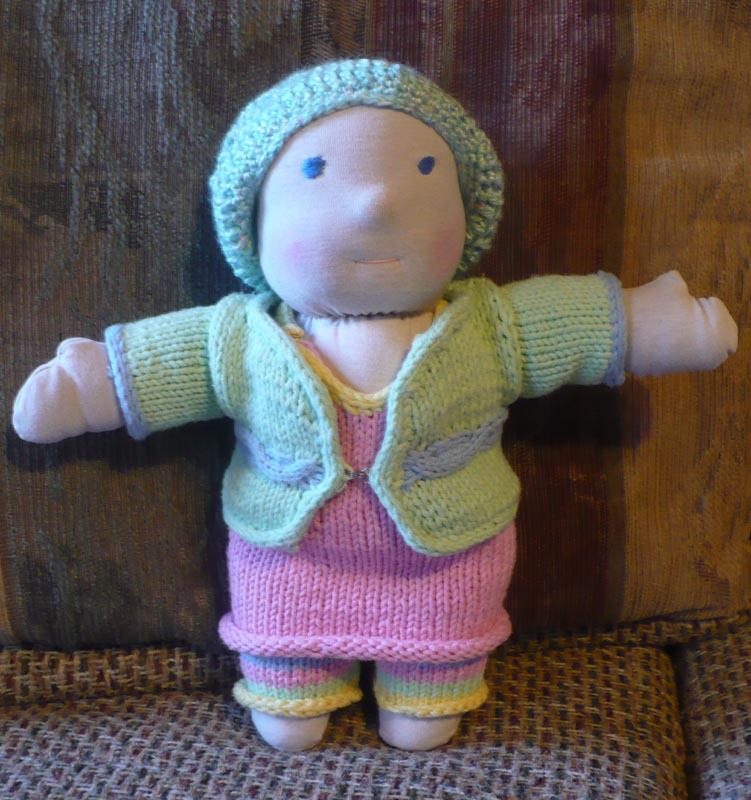 i intend to give her some hair, but i didn't have the right yarn for it. i'll post pictures again when she is completed with hair and her own outfit. Even with all the problems, i'm still pretty happy with how she turned out. This is my second attempt, again made from recycling a cotton t-shirt. 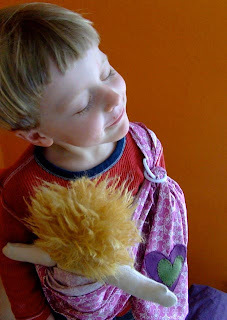 The dress is from another doll, i still have to make her outfit. She's not perfect, but i'm very happy with how she turned out, and again i learned a few trick i didn't know before. i found a solution for the problems i had with the hair, and am very happy with how it turned out!!! This girl's hair is gorgeous, the picture doesn't do justice. The brown is wool, and then i added a fun yarn to give it a little extra. 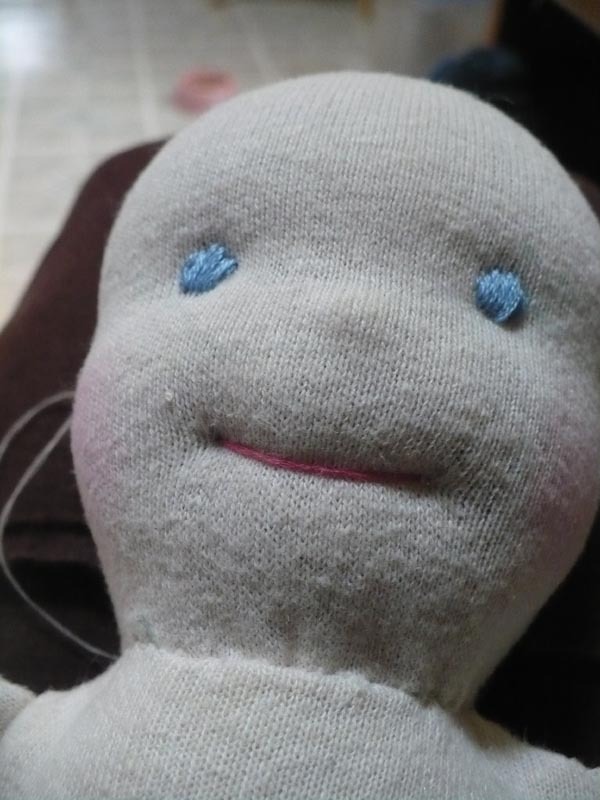 My daughter claimed this doll immediately. 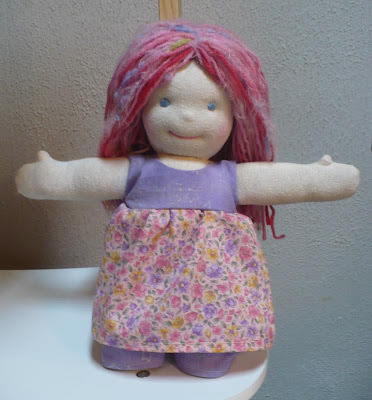 Yesterday, Kenan donated an really nice thick unbleached hemp t-shirt to my doll making cause. The fabric is so nice to work with!! i've been using my beautiful wool roving to stuff these, which makes me a bit sad. It's amazing how much wool is needed to stuff these dolls. Mine are not even as firm as i would like them. Anyhow, just wanting to show some progress. 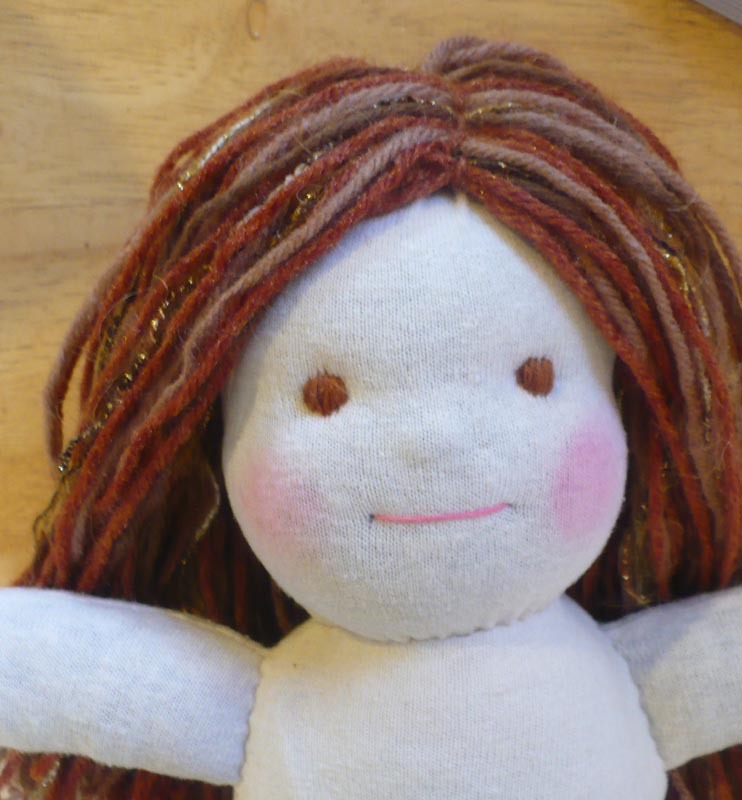 Three dolls in three days, and i have learned so much!This girl has a bit of a weak chin, but overall the shape of her face came out quite nicely. Neck wrinkles are minimal, and i have a few ideas about reducing them even more. 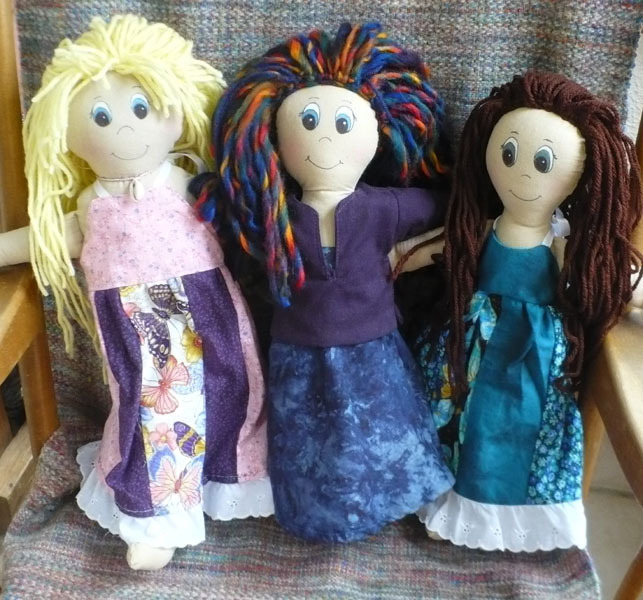 So one thing i am really loving about these dolls is that they are almost completely hand stitched. 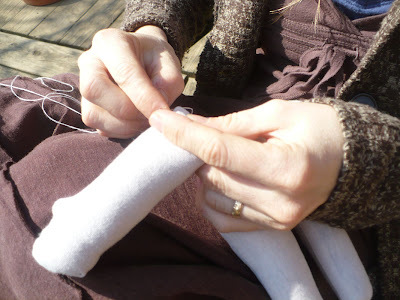 i do use the machine to stitch around the legs on the main body, and i machine sew the arms. However the head, the details and putting all the pieces together is done entirely by hand. 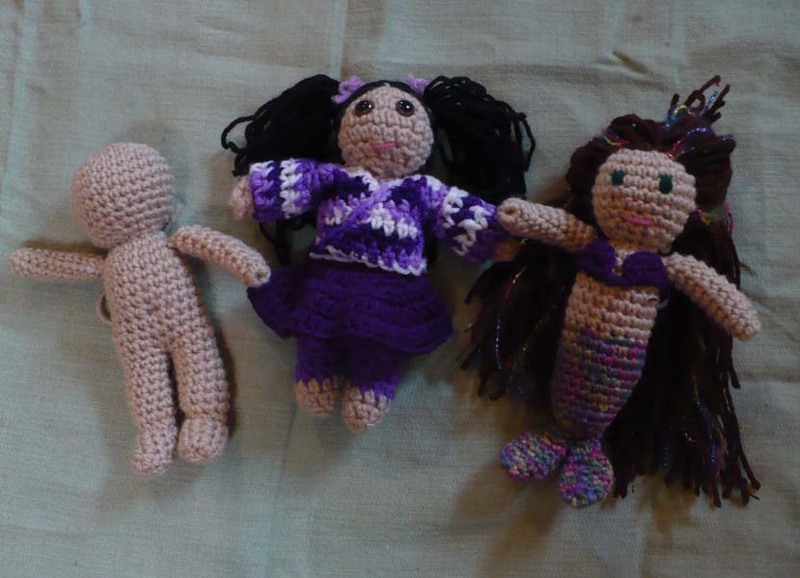 So i can carry these around and work on them anywhere, sitting outside, watching movies with the kids...i'm not stuck behind a machine and i feel much more connected to the process of making each doll. This photo is of her sitting on my lap at my computer desk, while i was working online and sewing dolls. So this is the latest head i have finished. i'll be working on the body today, but i am beyond thrilled with my progress. This one came together almost perfectly. Attaching the head to the body is always a bit tricky, but i've learned enough with the others that i am totally confident that it will go together well. 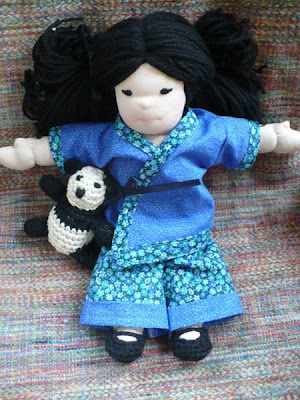 i'm hoping to get to the store to purchase some wool yarns for the hair this week, and then i get to start sewing up some clothing. i have also started looking around online to find a good source for the materials and wool. It'll be a bit of an investment, but i am really eager to begin this new endeavor. 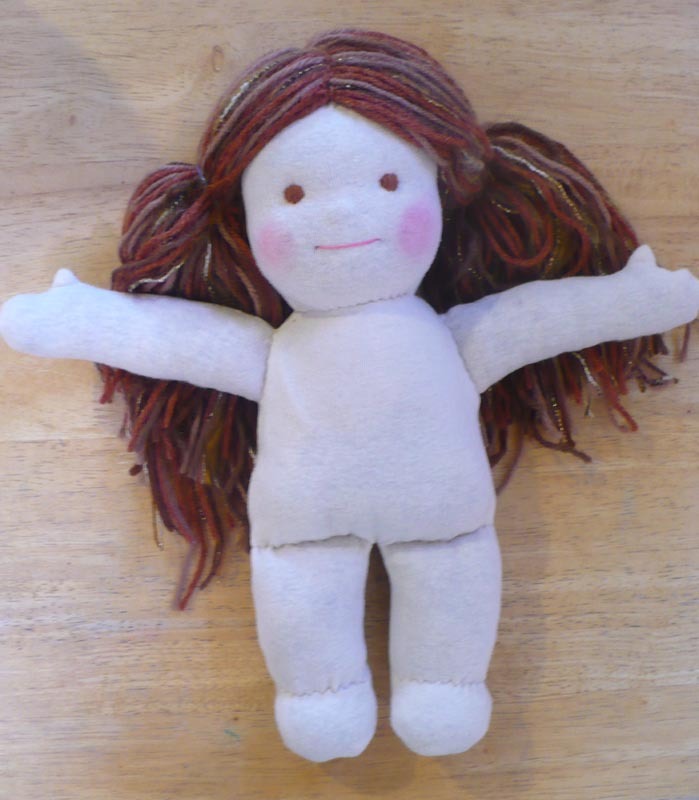 i also can't wait to share the finished dolls with you all, as i know they are going to be very cute. Stella Blue Creations Winner Announced!! i'll send you an email this afternoon. You'll have 48 hours to claim your prize or a new winner will be chosen! Today was one of our first 'spring like' days. It was wonderful. 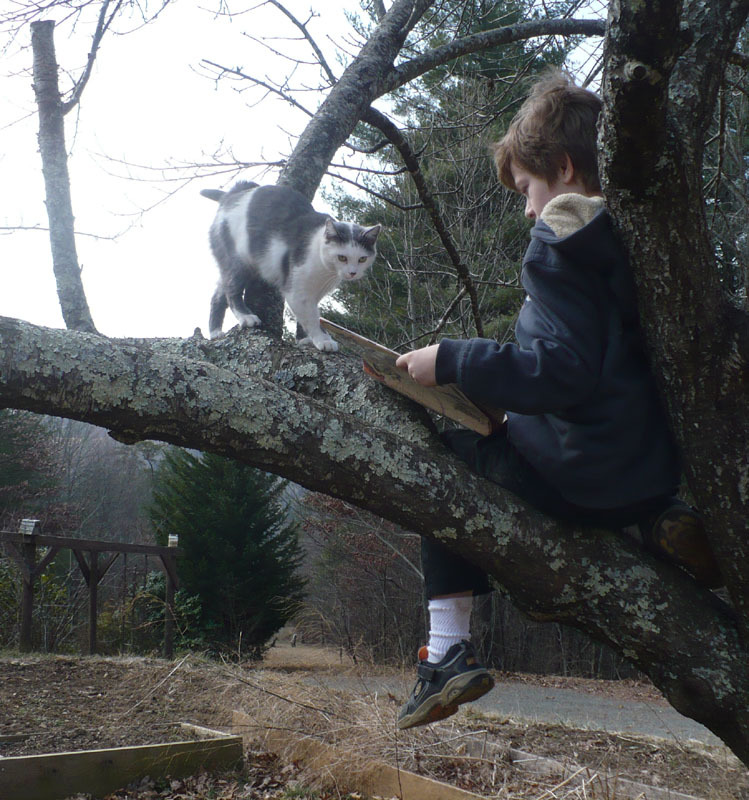 My boy read in his favorite reading spot. i spent the afternoon outside, hand stitching doll parts (i'll post about those in a different post) and counting birds. The Great Backyard Bird Count started today. :) We participate in this every year. i planted lettuce and spinach in one of the small raised beds. My boy spent most of the day outside running, jumping, climbing. Rufus the beagle followed him everywhere, and ran, jumped and climbed too. 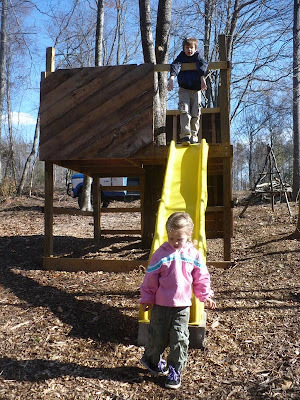 The dog even climbed up into the tree fort and slid down the slide! 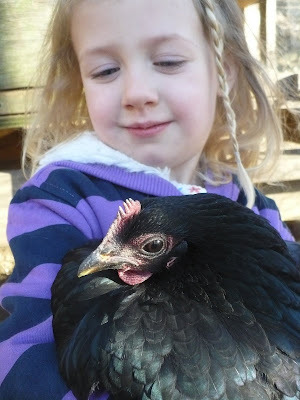 We chased chickens, and fed treats to the goats. We got dirt under our fingernails and had an absolutely wonderful time. 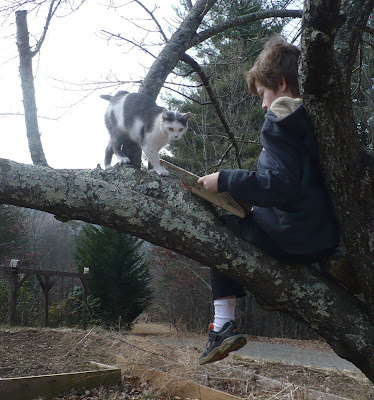 Wordless Wednesday; The Owl and the Pussycat. They Danced by the light of the moon"
i am super pleased to introduce you to the wonderful hand crafted work of Old Gates Farm. 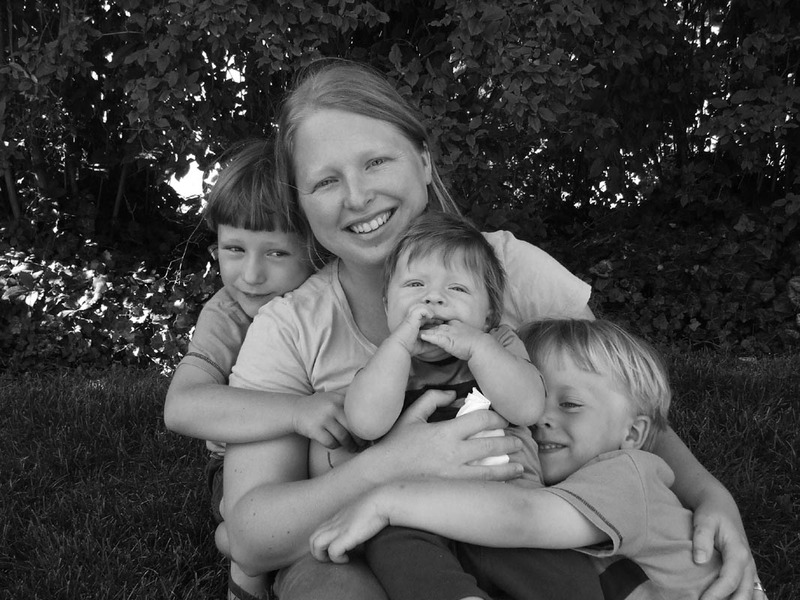 Kris, the face behind the Old Gates Farm Etsy shop, is a mama to 3 little boys, wife to a farmsteader, and an avid crafter when ever she can find a spare moment. She actually grew up on the shores of Lake Michigan, attended the same college that i did and has family in the same area that Kenan and i used to live. What a small world. :) Ten years ago, she moved to Vermont, met her husband and has settled down to try and grow what they eat and raise their babies in a simple way. Old Gates Farm is located in Castleton, Vermont. 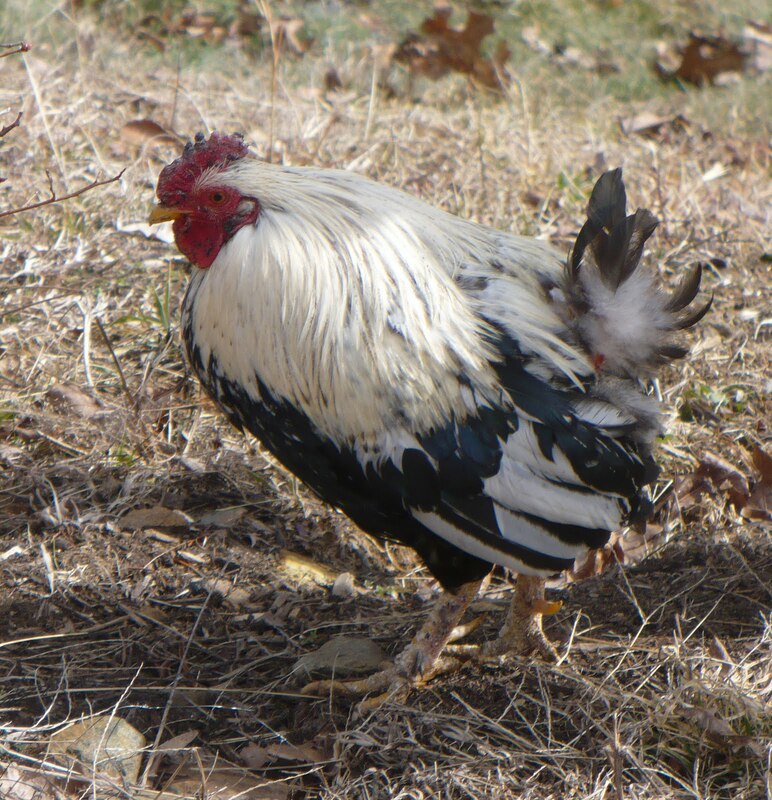 It is a small family run farm, with two milk cows, pigs and chickens. 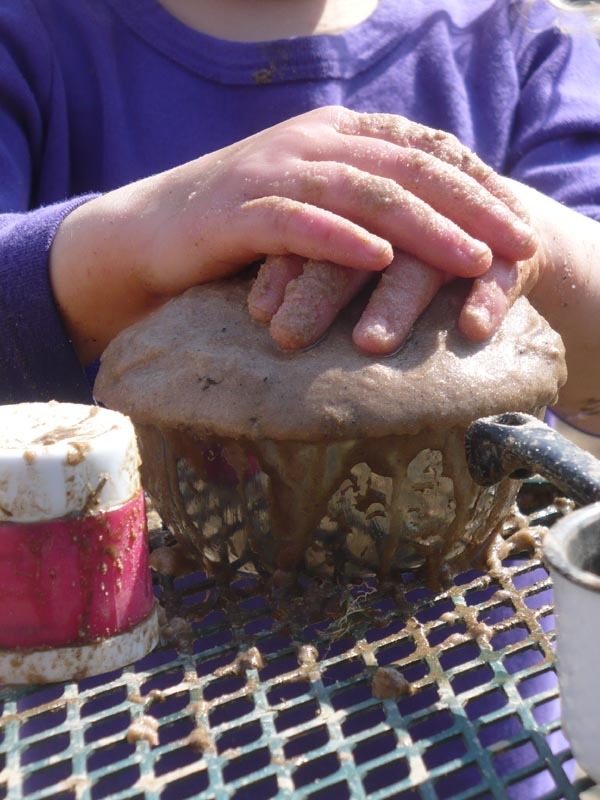 You can visit the website to learn more about the farm and see some amazing pictures of the gardens and land. Kris has been crafting since she was very young-thanks to her crafty mom (dortdesigns.etsy.com) She's always knitting something and has been trying her hand at sewing after receiving a hand me down machine from an aunt. 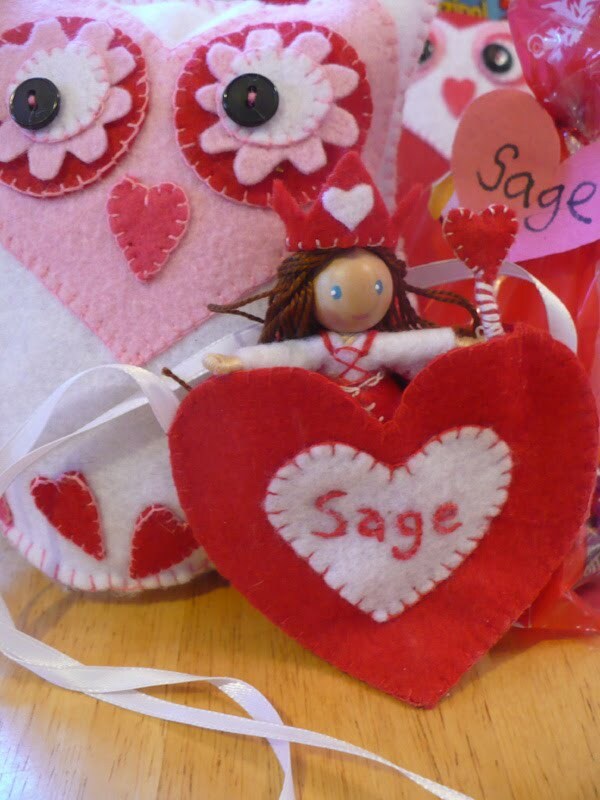 She creates a variety of goods including handmade soaps, knitted goods, doll slings, market totes and more! 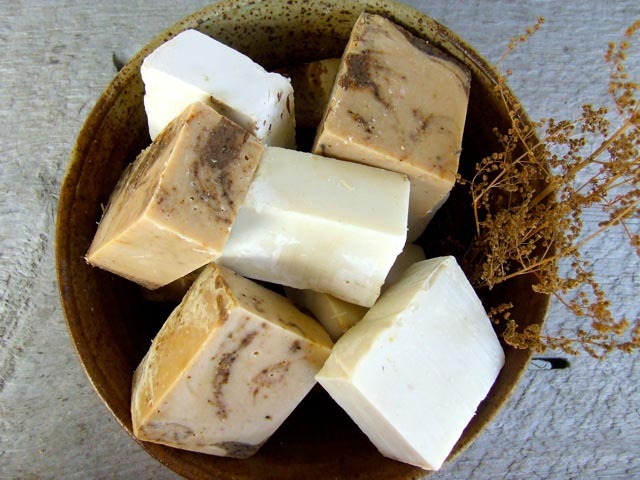 Besides oldgatesfarm.etsy.com, Kris sells her crafts, produce and meats at the local farmers markets during the summer and fall. She also vends local craft shows during the holiday season. 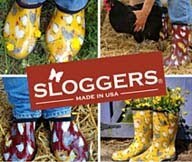 Kris has offered one reader a $15 GC/credit to Old Gates Farm Etsy shop. Head over to the Old Gates Farm Etsy store and let me know your favorite item! Please include your e-mail address or make sure it is visible in your blogger profile so i have a way to contact you if you win. 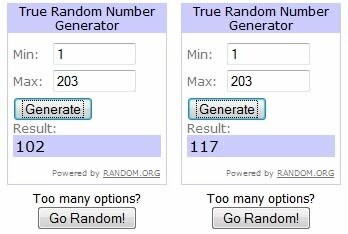 Otherwise a new winner will be chosen! please leave a new comment for each extra entry. If you qualify for 5 entries, leave 5 separate comments. 6. 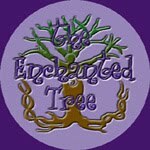 Tweet about the contest, including a link back to this post. leave a link to your tweet. 8. enter another of my active giveaways for 1 entry. 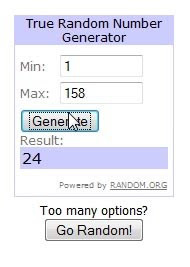 Winner will be chosen via Random.Org. i will then contact them by email, and post the winners name on my blog. This post is a bit late. i spent much of the week having fun with the valentines theme, but then ended up with two sick kiddoes, and a dental emergency. So i just didn't get it put together in time. i've seen a lot of folks complaining about the 'commercialization' of Valentine's day, and there is absolutely no reason it has to be commercial. 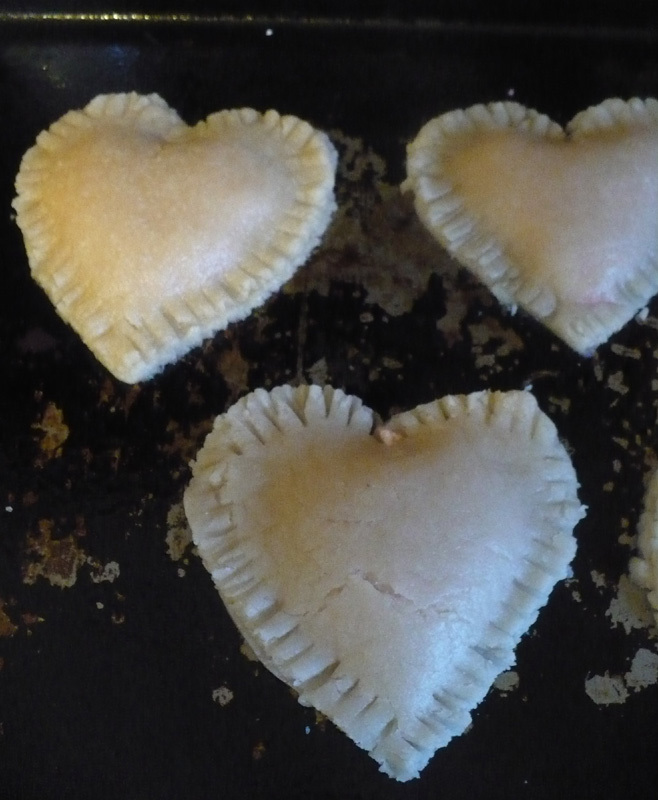 We had a blast with Valentine's day crafts/themes all week, gave handmade gifts and made lots of yummy treats. My son handmade his class valentines. 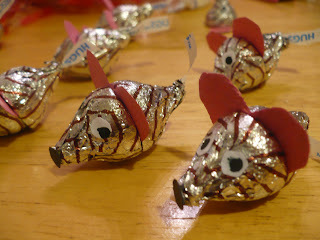 We did give candy too, but we didn't fall for any of special Valentine's themed/packaged goodies. Instead we made these cute little Mice hugs to go with them. These are made from two hugs with a paper heart between them. 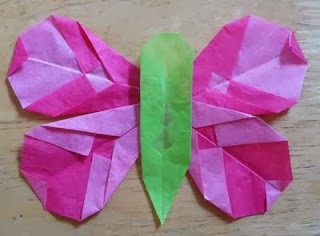 The eyes and nose are just cut from paper scraps. Those googly eyes would have been cute, but we didn't have any. Very simple and cute craft. The kids all loved them. 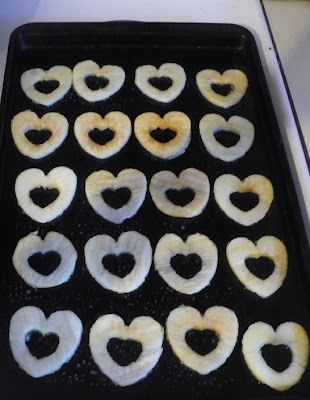 i came across a bunch of fun 'heart themed' snacks and foods and wanted to share them. We made heart apple chips after seeing a tutorial on Chalk in my pocket (fabulous blog!) These turned out wonderful, and my kids devoured them. i just happened to have this really basic heart cookie cutter, that worked perfectly for cutting the apples into hearts and removing the core all at once. There was very little waste. 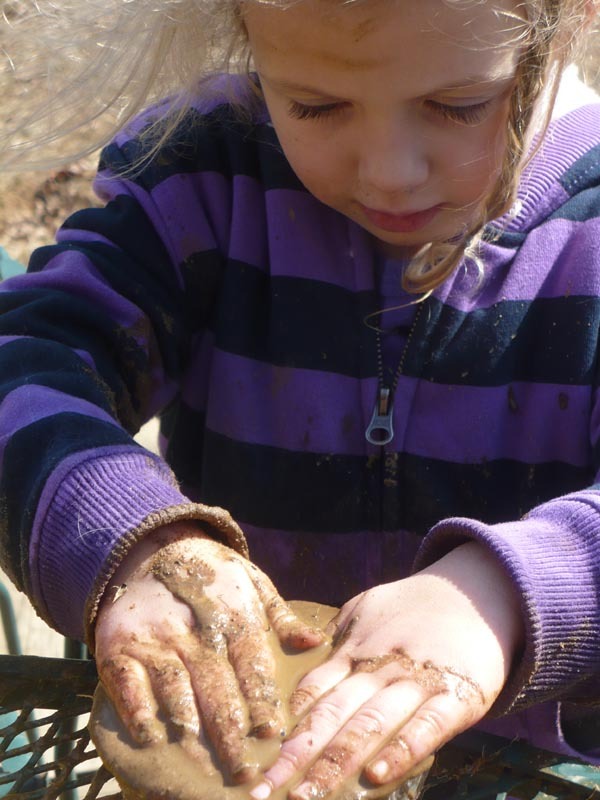 The centers went into the compost, and the apple skins when to the goats. 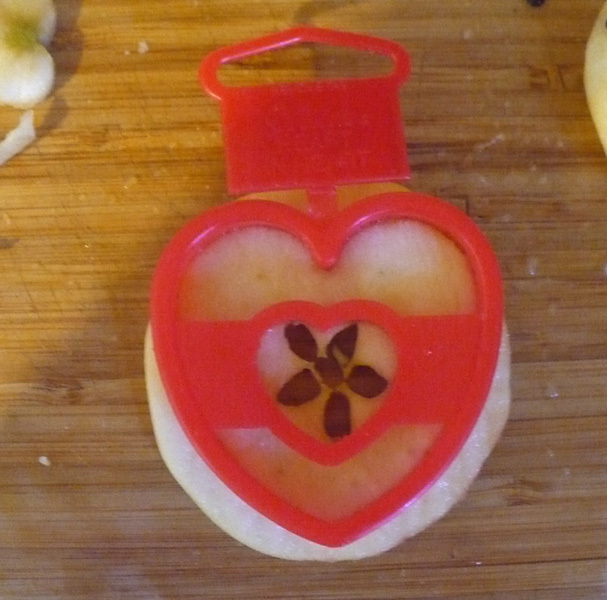 These are super easy to make, dip the apples in a little lemon/water to keep them from browning and then bake them at around 250 for an hour or so until they are crispy. Of course if you have a food dehydrator, that would work perfect too. Super easy and fun snack, and my boy enjoyed finding them in his lunch this week. 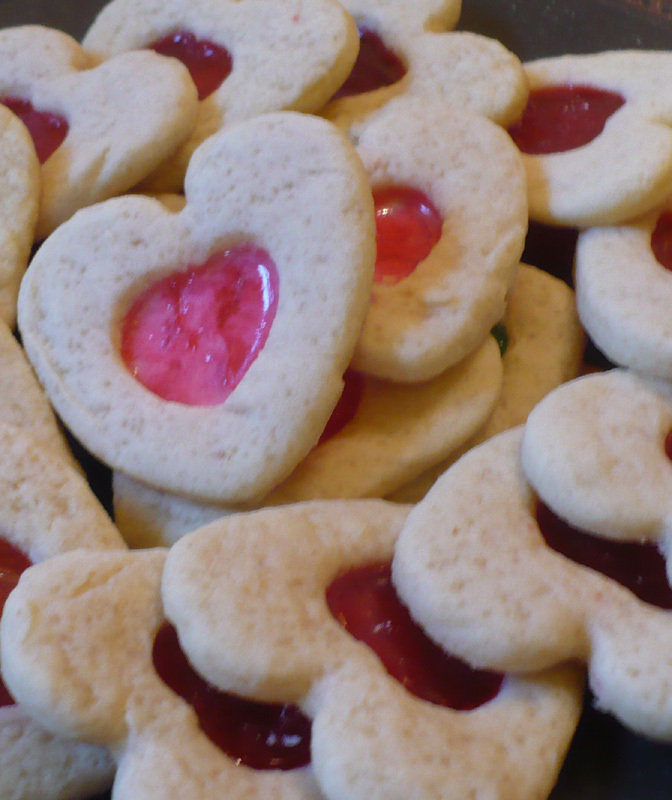 i made magic window cookies. Sage helped to put the candies in the centers. We used a roll of cherry lifesavers. For dinner on Valentine's day i made everyone's favorite! 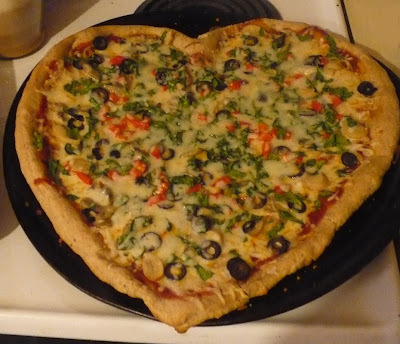 Heart shaped pizza! i made mini pizzas for the kids. 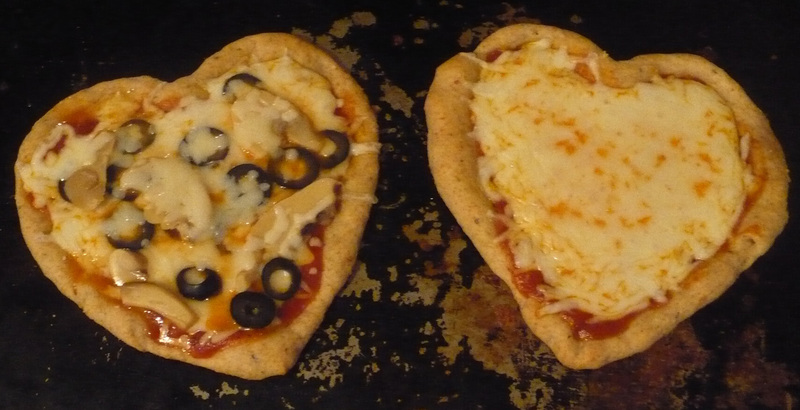 My boy likes mushroom and black olive, and my girl only likes cheese. My husband and i shared this one, it's mushroom, spinach, olive and red pepper. The kids received handmade Valentines and gifts as well. 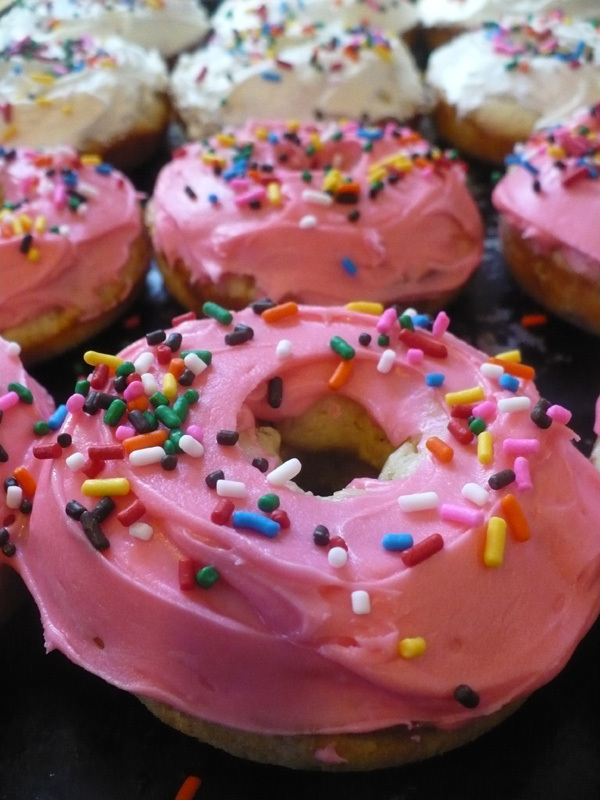 We definitely don't need a day reserved to show our loved ones we care about them, but it's a good excuse to make some sweet treats and get creative. Moss gardens in a Jar.